Bumble bees are big, fuzzy insects recognizable by their rounded shape and black-and-yellow coloration. The common species are 3/4 inch in length or more although we have a variety of sizes in Iowa. A small bumble bee is not a baby; it is just a small species. All bumble bees that you see flying around are full grown adults. The song about bringing home a baby bumble bee and having it sting drives us entomology nerds a bit nuts because baby bumble bees are white larvae and can’t sting, but we sound a bit grouchy when we try to point this out to the happily singing child. Baby bumble bees are found in the bumble bee colony. Like honey bees, bumble bees live in a colony where the adults care for the young (larvae) produced by a single queen. Bumble bee nests are small compared to honey bees, as each nest contains only a few hundred individuals. Also unlike honey bees, a bumble bee nest is annual and is used only one year and then abandoned. Bumble bees may re-appear in the same area from one year to the next but they do not reuse an old nest. Bumble bees colonies are usually underground in a deserted mouse or bird nest though they are occasionally found within wall cavities or even in the clothes drier vent. In the spring, each new queen selects a nest site and starts a new colony. She lines the cavity with dry grass or moss and then collects pollen and nectar to produce a stored food called “bee bread.” Her first brood of offspring, (5 to 20), will all be workers (daughters) who take over the colony responsibilities of nest enlargement, food gathering and storage, and feeding and caring for the larvae. The queen continues to lay eggs throughout the summer. By late summer, new reproductive males and females (kings and queens) are produced. These mate on the wing and the fertilized females move to hibernation sites in the shelter of loose bark, hollow trees or other dry, protected places to lie dormant through the winter. The males and workers still in the colony die with frost or the first hard freeze. Bumble bees are not as aggressive as ground nesting wasps, so having a bumble bee nest in your yard is usually not a problem, so if the vicinity of a bumble bee nest can be avoided, then it is best to leave them alone and wait for them to die in the fall. Live-trapping bumble bees for relocation is not practical and covering the nest entrance does not usually solve the problem. 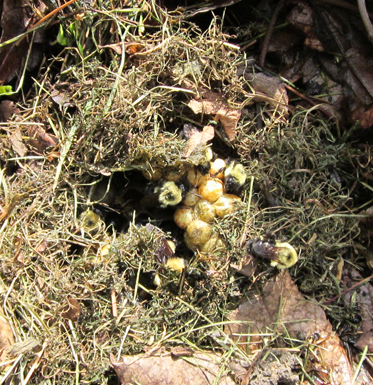 Bumble bees around a nest found in a pile of leaves. Photo by Al Eggenberger. Links to this article are strongly encouraged, and this article may be republished without further permission if published as written and if credit is given to the author, Horticulture and Home Pest News, and Iowa State University Extension and Outreach. If this article is to be used in any other manner, permission from the author is required. This article was originally published on June 1, 2011. The information contained within may not be the most current and accurate depending on when it is accessed.